Taking adventure-seekers to new heights in downtown Las Vegas. SlotZilla is an exciting zip line thrill attraction at Fremont Street Experience. See downtown Las Vegas as you’ve never seen it before. Fly SlotZilla! SlotZilla is a 11-story slot machine-inspired zip line attraction and is one of the best things to do in Las Vegas. The multi-million-dollar SlotZilla is the world’s largest slot machine and features Las Vegas icons such as over-sized dice, a martini glass, pink flamingo, coins, video reels, a giant arm and two showgirls. Save $5 on either line by flying before 6:00 p.m. Nevada residents, members of the military and seniors (65 and older) get 15% off. Also, when you Zoom, get 25% off a Zip ticket, and vice versa. The Zipline costs $25 and starts off 77 feet up. Flyers will be in a seated position and land halfway down the Fremont Street Experience pedestrian promenade, between the Four Queens and Fremont casinos. The Zoomline is $45 (Fri. and Sat. after 6:00 p.m. is Primetime Pricing, $49) and takes off more than 10 stories up (114 feet) and whisks flyers 1,750 feet, all the way down the Fremont Street Experience, to a landing platform at the city’s most historic casino, Golden Gate. 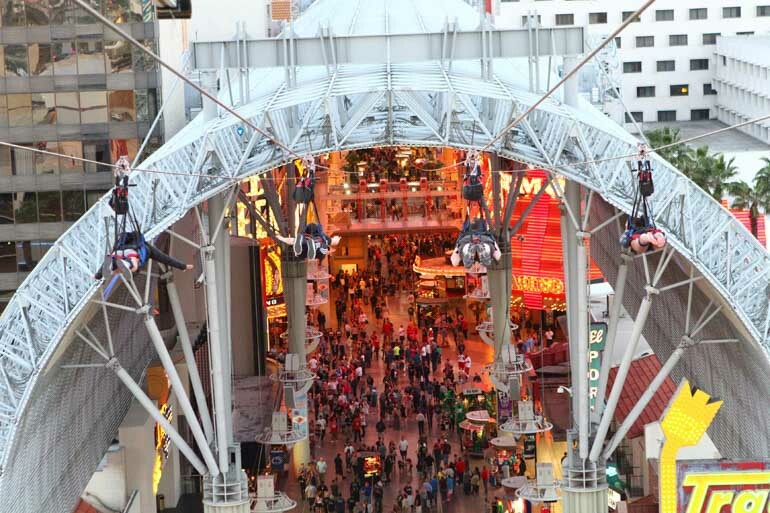 The upper Zoomline provides even more thrills by sending flyers prone, or “superhero-style,” for an unprecedented view of the party that never ends at Fremont Street Experience. We guarantee it’s unlike anything you’ve ever done before and are unlikely to ever forget! 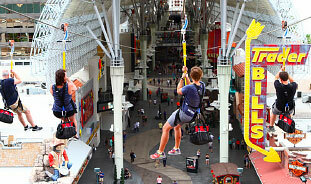 Flyers travel down the zip lines at up to 40 miles per hour. The 35-foot-tall showgirls (actually 35 feet, 2 11/16 inch) adorning SlotZilla, one on each side, were inspired by two real-life models, the women who dressed as showgirls to accompany former Las Vegas mayor Oscar Goodman to his many public appearances. Their names are Jennifer and Porsha. That could win you a bar bet someday! SlotZilla’s zip lines were built in collaboration with Zip-Flyer, experts in zip line engineering and installation. Check them out. The SlotZilla Las Vegas urban zip line is unlike any other experience in Las Vegas, or the world, and is guaranteed to quicken your pulse and absolutely rock your world. Have a question? See our SlotZilla FAQ. Once you fly on SlotZilla, make sure to share your photos and video. Use #SlotZilla on Twitter so we can Retweet your pics. Photos are available for purchase when you complete your ride. Share them in social media and use #SlotZilla.